Hosting an elegant Easter brunch or spring soiree? I’ve got the perfect floral party favors for you! 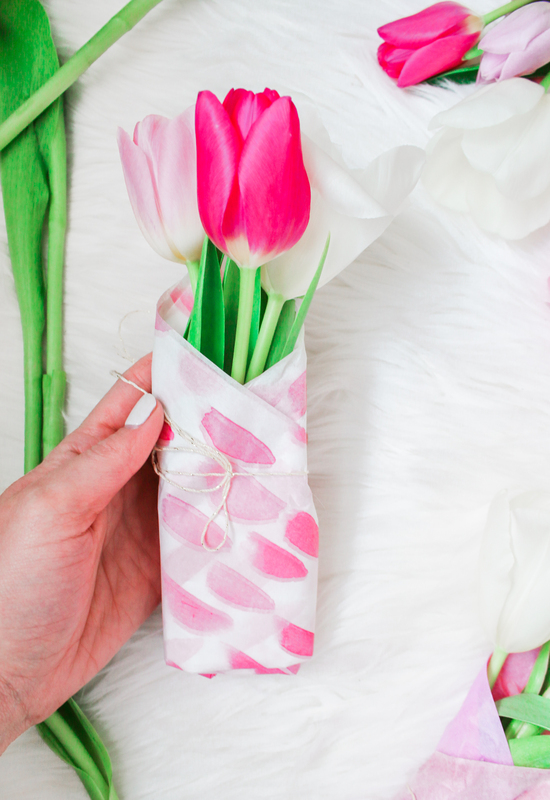 They’re DIY mini tulip bouquets, and they’re ridiculously easy to make! I found some Galentine’s Day-inspired mini spray rose bouquets on Pinterest, and I figured it’d be fun and festive to do the same with seasonal flowers for Easter. I chose tulips, since they have the cleanest foliage and don’t need any filler flowers to make a full bouquet. Not only do they make great Easter party favors, they also function as elegant place cards for festive country spring tablescapes, too! All you need to make mini tulip bouquets is some pretty pastel tissue paper (I found mine on Amazon), 2-3 dozen fresh tulips, twine, and scissors. Also, depending on how long the function is, you may want to invest in some floral water vials. Any pastel tissue paper will do– but how gosh darn pretty is this watercolor tissue paper? Each sheet is 15″ x 20,” so it’s perfect for crafting. Before you start snipping stems, decide on a size and theme for each spring tulip bouquet. I chose multicolored tulips in sets of three. I also decided to keep the stems about five inches long, which worked perfectly. Then, I folded the tissue paper in half into a triangular shape. I folded the bottom a few times to better fit the bouquet and then arranged the tulips around the apex. Next, fold the bottom of the tissue paper around the tulip stems and gently roll up the sides one by one. The wrapping process should be similar to a Chipotle burrito. Secure either with ribbon, string, or natural twine. I also thought it’d be fun to mix up the tissue paper, so I incorporated two distinct patterns into my mini spring tulip bouquets. Repeat for every guest attending your event– and voila! You’re done! I also love the idea of using mini bouquets as place cards, as well. Simply attach a name card to your spring tulip bouquets and place on top of a pastel napkin and plate. It looks super cute and festive, especially if you’re going for a more minimalistic, country spring decor motif. Is anyone else hosting brunch this Easter Sunday? Even though it’s a higher stakes meal (right up there with Thanksgiving in my family! ), my fool-proof strategy has always been to keep guests entertained– and hydrated. Give this delicious white peach spring sangria a try! Oh, and if you’re not sure what to wear, be sure to check out this all white Easter brunch outfit idea! Happy hosting, y’all!